9ct yellow gold blue Topaz stud earrings. Set in a classic four claw setting with 5mm width. A gift she'll treasure. 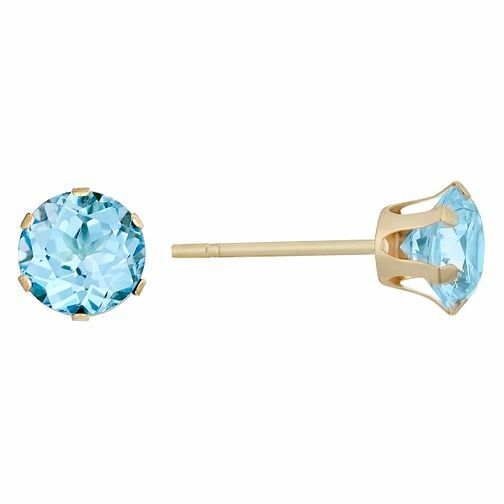 9ct Yellow Gold Blue Topaz Stud Earrings. is rated 4.4 out of 5 by 8. Rated 5 out of 5 by Anonymous from Very pretty and good quality Lovely small earrings for a little girl. Good quality so no irritation to the skin. Order and delivery excellent. Rated 4 out of 5 by Anonymous from Pretty earrings my son bought these for me as a christmas present and i will be wearing them at my daughter's wedding in February. They are just perfect.